The upper extremity or upper limb is the region that extends from the deltoid area to the hand. That includes the shoulder, axilla, arm, forearm, and wrist. A study of the cross-sectional anatomy allows a visual medium that facilitates the understanding of the structural organization of this area. That allows us to have a unique representation of the positions, sizes, shapes, and relationships of the structures present in the upper limb of the human body. The shoulder is the most proximal part of the upper extremity. Its bony framework consists of the scapula, clavicle, and the proximal end of the humerus. The muscles present in this area are the deltoid, infraspinatus, pectoralis major, pectoralis minor, subscapularis, coracobrachialis and the latissimus dorsi. Other muscles that can be seen in a shoulder cross section are the teres major, teres minor, omohyoid, trapezius, subclavius and intercostal muscles. The arm is the first and longest segment of the free upper extremity. Its skeleton is formed of the humerus and its muscles are divided into anterior and posterior compartments. Muscles of the anterior compartment are the biceps brachii, brachialis and coracobrachialis. The posterior compartment consists of only one muscle - the triceps brachii. The forearm is the second segment of the free upper extremity. Its framework consists of two bones - the radius and ulna. The forearm is also comprised of two muscle compartments. The anterior compartment consists of the flexor carpi ulnaris, palmaris longus, flexor carpi radialis, pronator teres, flexor digitorum superficialis, flexor digitorum profundus, flexor pollicis longus and pronator quadratus muscles. The posterior compartment, on the other hand, consists of the brachioradialis, extensor carpi radialis longus, extensor carpi radialis brevis, extensor digitorum, extensor digiti minimi, extensor carpi ulnaris, anconeus, supinator, abductor pollicis longus, extensor pollicis brevis, extensor pollicis longus and extensor indicis muscles. The hand is the most distal part of the upper extremity. Its skeleton consists of eight carpals (scaphoid, lunate, triquetral, pisiform, trapezium, trapezoid, capitate and hamate), five metacarpals (I-V), and phalanges (each digit has three, except for the thumb, which has two). The intrinsic muscles of the hand, meaning those present entirely in the hand, are comprised of the palmaris brevis, interossei, adductor pollicis, abductor pollicis brevis, flexor pollicis brevis, opponens pollicis, abductor digiti minimi, flexor digiti minimi brevis, opponens digiti minimi, and lumbrical muscles. It should be mentioned that some of the forearm muscles insert in this region and are seen in a hand cross section. The arteries present in the upper extremity are the axillary, anterior and posterior circumflex humeral, brachial, radial, ulnar, superficial and deep palmar arches, and the common digital arteries. Superficial veins found in this area are the cephalic, basilic, axillary and median cubital veins, while the deep veins present correspond to their arteries and bear their name. The nerve supply of the upper extremity is comprised of the axillary nerve, musculocutaneous, radial and ulnar nerves, together with all of their branches. X-rays are usually the imaging modality of choice when it comes to evaluating the upper extremity region. However, computed tomography (CT) angiography has shown to be ideal for detecting vascular injuries like dissections, occlusions, aneurysms, fistulas, and focal stenosis. Magnetic resonance imaging (MRI) is also recommended when examining the major joints of the upper extremity. 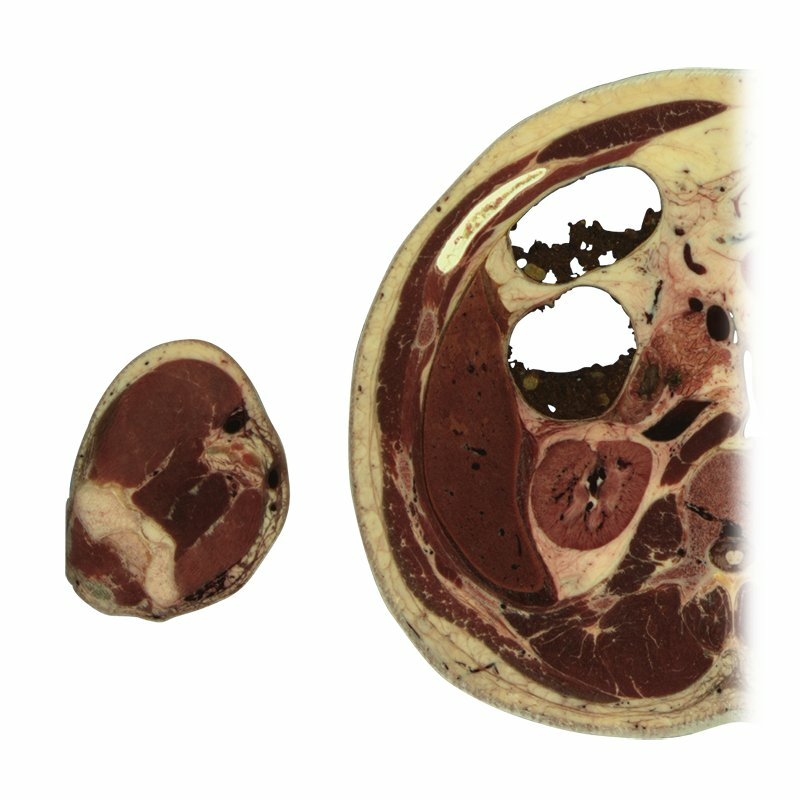 Both of the aforementioned scans depend on the cross-sectional analysis of the anatomic structures present in this region and play a vital role in clinical practice. Want to learn more about the Upper extremity? Structures at the lowest part of the arm. Structures of forearm at the level of the flexor carpi ulnaris muscle. Structures of the wrist at the level of the radiocarpal joint. Cross section of the hand at the level of the hypothenar eminence.